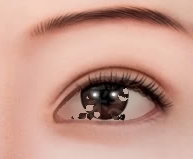 As soon as the pain disappeared I looked up to the mirror and saw that my eyes weren't the almond shape but more the shape of the eyes of a Japanese person. I wasn't scared, I was curious. Was that thing in my eye making me look like a westerner? Are we all born with the same style eyes but doctors put these prosthetics in so we look different? if so, what else do they do? I opened my eyes wide and saw the colour crumbling and all of it falling to the bottom of my eye, I got scared but gently with my fingers tried to put the colour back to its place.